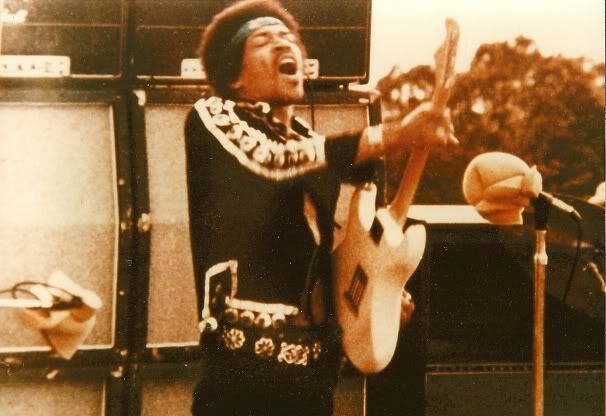 Jimi performing during the concert. After realizing that his youth counterculture film Rainbow Bridge was floundering, producer Mike Jeffrey brought in his client Jimi Hendrix to film an outdoor concert near the Haleakala Crater located in Maui, on July 30, 1970. This was done to hopefully reap his investment which he spent on the production of the movie. Although over 50 minutes of footage was shot for the film, the final version of the film features only 17 minutes of Hendrix's concert, which were highly edited to shorten the length of each song. To date, no additional footage has been officially released and the remaining film can only be found on the internet in bootleg format. July 30, 1970 Spanish Castle Magic Unknown. Possibly filmed. Exists as audio. July 30, 1970. Lover Man Exists as audio recording. July 30, 1970 Hey Baby Filmed and recorded as audio. July 30, 1970 In From The Storm Filmed and recorded as audio. July 30, 1970 Message To Love Exists in audio format. Possibly filmed. July 30, 1970 Foxy Lady Filmed and recorded as audio. July 30, 1970 Hear My Train A Comin Filmed and recorded as audio. July 30, 1970 Voodoo Child Filmed and recorded as audio. July 30, 1970 Fire Exists as audio recording. Possibly filmed. July 30, 1970 Purple Haze Exists as audio recording. July 30, 1970 Dolly Dagger Filmed and recorded as audio. July 30, 1970 Villanova Junction Filmed and recorded as audio. July 30, 1970 Ezy Ryder Exists in audio format. Unknown if filmed. July 30, 1970 Red House Exists in audio format. Unknown if filmed. July 30, 1970 Freedom Exists in audio format. Unknown if filmed. July 30, 1970 Beginnings Exists in audio format. Unknown if filmed. July 30, 1970 Straight Ahead Exists in audio format. Unknown if filmed. July 30, 1970 Hey Baby Exists in audio format. Unknown if filmed. July 30, 1970 Midnight Lightning Exists in audio format. Unknown if filmed. July 30, 1970 Stone Free Exists in audio format. Unknown if filmed. Of the 20 songs played and recorded, Only 3 have been officially released. In From The Storm, Hey Baby and Foxy lady. The remaining 33 minutes of footage can only be found in bootleg format across the internet. A short clip of "Hear My Train A Comin" from the concert. A complete version of Voodoo Child from the concert.